A sense of psychogeography hums underneath the surface of a lot of music. Yet in Glasser’s new album, Interiors, it is not just present, but a part of the thematic foundation. Not too long after Glasser’s Cameron Mesirow released her debut album, Ring, in 2010, she moved from her horizon-stretching home state of California to the vertically-crammed spaces of New York. In a city where space is premium, “space” would become a fixation for Interiors, a guiding concept for a collection of textured electronic songs that are both dense enough with ideas to fittingly reflecting the physical environment that they were nurtured in, as well as sonically expansive enough to stretch and breathe unconfined. Mesirow grew up in an artistically-inclined household, with both of her parents being involved in music. She describes her mother as being more of a “visual” kind of musician; she is in a group called Human Sexual Response that experiments with “a lot of fun putting on wigs and stuff.” Her father, on the other hand, is an accomplished guitar player who leaned more toward the “audio” side of things. It’s easy to see why Mesirow believes that she came away with a combination of those traits. Her extended creative family also includes is the visual artist Tauba Auerbach, who Mesirow says has had a huge influence not just on Glasser, but on her life in general. “I feel like I’ve just learned so much from being around her,” she explains. To help adapt the sound of Interiors for the eyes of consumers, Mesirow enlisted the help of video artist Jonathan Turner, who is a part of the performance art group Yemenwed. “I went to him fairly early on and told him I felt that my last record — even though I liked all the visuals that went with it — didn’t feel like it explained anything about what I was doing or going for on the record, and that I wanted to start the process of making the visuals really early on Interiors because it was important to me that they were really, really good and well thought-out,” explains Mesirow. She and turner began discussions as far as late 2012, and the “Design” video was shot in early February of 2013. By her own admission, it has been a long process, though she ultimately believes that starting early has positively informed the direction of the finished product. One shared influence between Turner and Mesirow was Hipgnosis, the famous English art design group that started in the late 1960s. Hipgnosis were film and art school students when they began designing record covers for rock bands. Using techniques of photo manipulation to create surreal and elaborate images, their work quickly became sought after. Their first was for Pink Floyd, and they eventually went on to do covers for most every glam and prog rock band from that era that one can think of. While Mesirow and Jonathan took inspiration from the group, they took note not to copy them. “We wanted to make a classic album where the music and the visuals have a consistency — that was the general idea,” explains Turner. 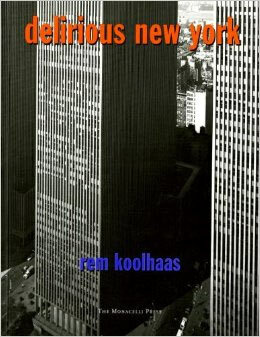 Since its original publication in 1978, Delirious New York has attained mythic status… Rem Koolhaas’s celebration and analysis of New York depicts the city as a metaphor for the incredible variety of human behavior. At the end of the nineteenth century, population, information, and technology explosions made Manhattan a laboratory for the invention and testing of a metropolitan lifestyle — “the culture of congestion” — and its architecture. Taking the analysis one step further, Mesirow draws parallels between cities and the people that inhabit them, which includes herself. References to space and how they play in with her own being are found throughout the record: “Landscape” closes by touching on the restrictions of walls surrounding a changing person; she crosses vast distances in “Dissect” and “Divide”; and “Windows I”, “Windows II”, and “Windows III” hint at architecture with just their names alone. Turner, too, found similar inspiration in Mesirow’s recommendation of Michelangelo Antonioni’ s film, Red Desert. On Interiors, there are two opposing states of being that Mesirow expresses — one of “being inside and needing to get out”, and one of “being outside and needing to get in”. Also at the heart of those polarities is the feeling of “desire” — the need to be somewhere or away from somewhere, and the forces that keep the individual unstable as they push and pull one way to the other. In the videos for Interiors‘ first single, “Design”, and the just-released follow-up, “Shape”, that desire is represented by a fluid silver metallic presence that is central to both. In “Design”, it is an amorphous but contained object that floats in the center of the frame; in “Shape”, that same object seems to have swallowed the whole of existence, including, ultimately, our heroine. Turner’s idea for this quicksilver-like object originally came out of furniture designs he came up with in collaborations with another architect. Whatever its origins or intentions, the object inspires a range of responses and interpretations. Turner states that the “Shape” video also has different moments of one’s experiences with uncertainty, and other moments of having the willpower to overcome that uncertainty. It goes in and out of different phases — again reflecting the sentiments of “being on the inside and trying to get out” and “being on the outside and trying to get in”. Watching that “silver essence” play a sort of co-starring role in those videos, another theme comes to the fore of Interiors: fluidity. Not only that, but a reflective fluidity. Mesirow confirms that this was part of the original idea.